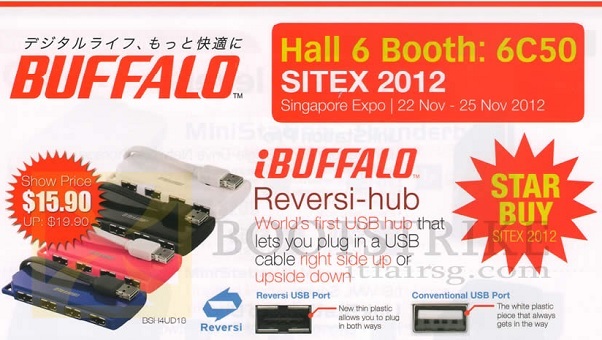 SITEX 2012 IT Exhibition Sales @ Singapore EXPO starts from Thursday (21 Nov 12) and run through the weekend. While it is no Black Friday Sale, it is the last IT Fair/Show for the year and it is still a good time to go shop for cheap christmas presents for your geeky friends. Do your homework and research prior to heading down. It helps to know which Hall your desired booth is otherwise you may end up walking in circles trying to locate a particular shop. This is especially so for SITEX as it would be held in Expo and would span across three exhibition halls. A portable USB charger allows you to charge your USB-powered devices on the go. It’s a handy portable power solution to keep in your bag, in your car, for your mobile phones and tablets. Especially when most devices are not able to last more than a day. If you know someone who would still be holding to an iPhone 4S for quite a long period of time, then the Apple versions get even cheaper. I think we have all encountered the problem of not knowing which side of the USB plug faces up. This new USB hub from Buffalo would overcome this challenge and not too significant a premium too. A good USB hub would cost about $6-$10. At $15.90, the world’s first reversi-port USB hub that allows USB devices to be plugged in any direction, without the frustration and hassle of having to manually check the port every single time before use, isn’t too expensive. These device also come with a reversi-connector which allow you to fits either way into any standard USB port. Mobile phone accessory stores are very common at IT Shows. Likewise for computer peripherals like bluetooth or wireless LAN adapter. You can often pick them up at a discount but if you are not too much in a hurry, generally mobile phone cables like micro USB and cases tend to be much cheaper. For the lightning to USB iPhone 5 cable, it retails for $17 at SITEX. In comparison, it sells online for about $10-$12. However, do factor the longer waiting duration. While all the talk is on cloud storage, sometimes nothing beat just passing over a thumbdrive. Great prices generally for thumbdrives and storage media at the IT show, with slightly under a dollar per gb. The TL-WR702N is the smallest wireless router in the world and at the same time, very easy to use. A traveler need simply to plug a hotel room’s WAN cable into the port provided and enter a default password to instantly create a wireless hotspot in the room. The device, which can be powered by an external power adapter or USB connection to a computer, can conveniently connect to the internet and share the connection around an average sized room. It is portable and lightweight, and best of all, cheap at only $35. Amazing blog! Do you have any suggestions for aspiring writers Im planning to start my own blog soon but Im a little lost on everything. Would you propose starting with a free platform like WordPress or go for a paid option There are so many choices out there that Im completely confused .. Any suggestions Bless you!